Rolled up and down on tracks laid beside the pitch. 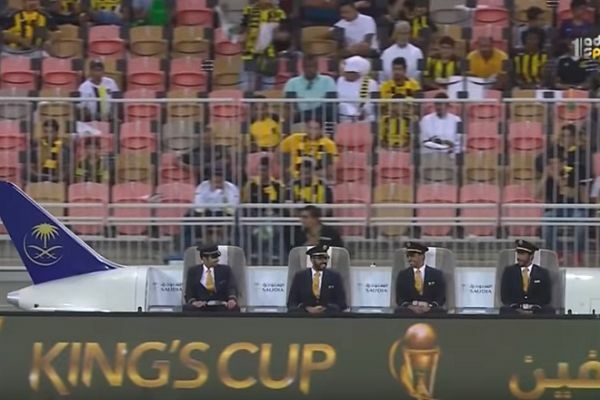 Al-ittihad Jeddah won Saudi Arabia’s Kings Cup after beating Al-faisaly 1-3 on Saturday, watched by four airline pilots sitting on a miniature aeroplane beside the pitch. The Saudia jumbo jet rolled up and down some specially-laid tracks in line with the position of the ball on the pitch at the King Abdullah Sports City Stadium. The clash was officiated by Mark Clattenburg, now Head of Refereeing for the Saudi Arabian Football Federation.